I keep threatening to join the Abuja Cricket club - they seem to lose consistently to teams like the Kaduna Crocodiles - they need my services of course. Twenty years ago, I was a wannabe demon fast bowler. I guess now I am a hasnotbeen notsodemon medium pacer. In writing this post, I have been trying to compile a list of all the cricket clubs in Nigeria (sadly the Nigerian Cricket Federation site is a little light on the content side). 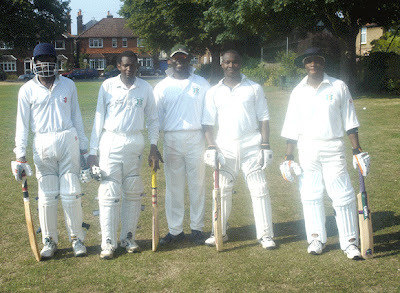 The London Nigerian cricket site (from where I lifted the photo) is here. I like the picture of the cricket lunch being a hearty tub of jollof rice - a lovely African twist that beats cucumber sandwiches and mayonnaise hands down. Bizarrely enough, there is a short news piece on Nigerian cricket on the English language version of the Chinese People's Daily site, which mentions the Unity club of Awka and the Flying 16 of Benin (not sure what happens to the other 5 men when they are playing). This article mentions teams in the Lagos League called the Pioneers, the Rocks, the Levites and Midas inter alia. There is an interesting colonial story to be told about cricket in Nigeria - see the beginnings of the story here. The expatriate colonialists set up the Nigeria Cricket Association in 1932; the local population setting up the Nigerian Cricket Association the following year. The two associations were divided on racial lines until 1951, when the two bodies formed a joint Board of Control. One can imagine how various racial/colonial tensions were played out on the field all those years ago, just as in India.. Thanks Aiyekoto for inspiring this post. ... to jamowonder ... yes we do play cricket ... what school did you go to?